When we first met with Junedy & Rocky, it was obvious that they were going to have a unique and beautiful wedding. They decided to book our Creekside Brunch Package with hopes of having an intimate wedding and reception with their closest friends & family. The menu consisted of breakfast goodies all topped off with a cinnamon roll cake! During our planning process, they found out that they would be expanding their family soon. Junedy & Rocky came up with the fun idea of doing the Gender Reveal at the wedding reception. This couldn’t have worked out better, it was a joyous occasion for everyone! It was a beautiful day to not only tie the knot, but find out they would be parents to a baby boy! Talk about a sweet couple! We met with Brad & Jessica a year before their wedding date. 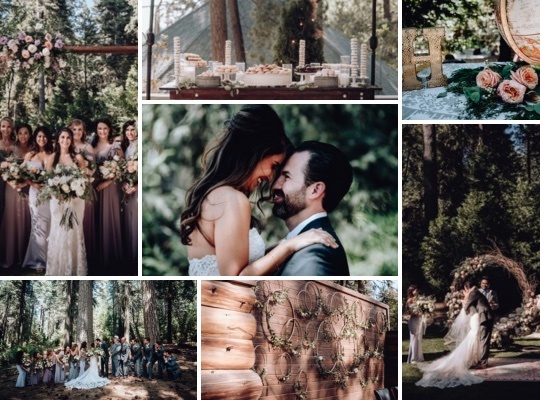 From the very beginning, Jessica had a vision of a forest wedding with colors that would complement the forest. 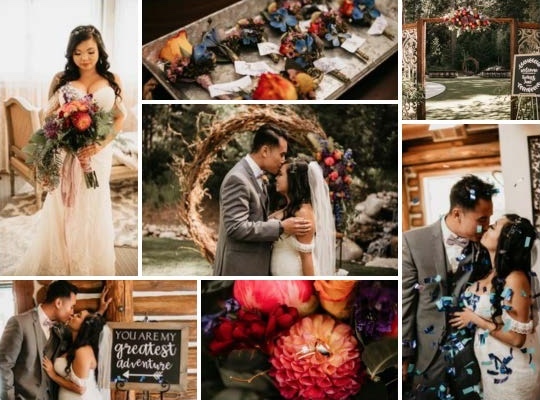 Her talented mother designed all of the flowers for the wedding and it was blooming from top to bottom! The ceremony took place in our Creekside Ceremony Venue and the reception followed in our Whispering Pines Terrace. All 250 guests joined in to enjoy the buffet dinner, tasty dessert bar, and a full dance floor! We met with Beta about a year before her wedding while our wedding venue was being built. She was actually our very first bridal tour! 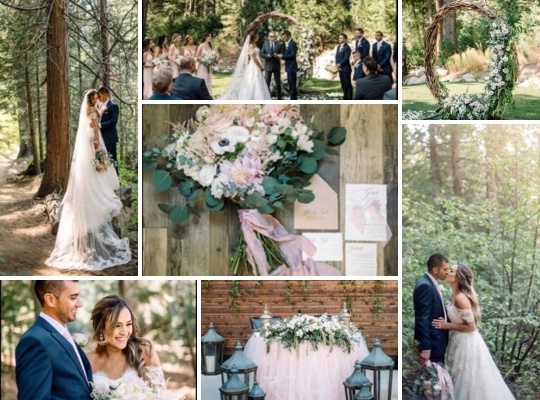 Beta had a very clear vision of the theming and design concepts for her wedding; Forest Bohemian. She hired on a wedding planner to help with everything planning from A to Z. Her planner was a huge help to us when it came to expressing her vision. We anticipated the wedding date knowing that it would be one of our most unique weddings! The day of the wedding could not have gone smoother, from gorgeous linens being dropped to the unique hoop backdrop everything on her Pinterest board came to life. SkyPark Weddings was very happy to be a part of Beta & Daniels special day! Chelsea & Rory are the sweetest couple you could ever meet! Chelsea is a flight attendant and has a flare for travel, while Rory has a very calm and sweet demeanor. They got engaged in Prague and it sounded magical. When we first met with them, Chelsea made it clear that she wanted to DIY a few items and design the space from top to bottom! She was so talented at designing her dream wedding, on the day of the wedding everything came together beautifully. 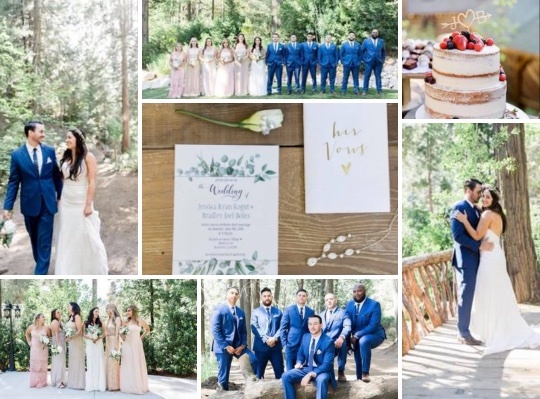 The peachy tones with the sage green accent colors were a perfect combination and color scheme to not only compliment the forest, but to compliment the couple. They celebrated the night with their closest family and friends under our beautiful overhanging bistro lighting. Talk about details! Maggie & Brian’s Wedding was full of ornate details everywhere you looked. They included a lounge area for the cocktail hour, as well as a Whiskey & Cigar Bar. The dessert table did not fall short of amazing creations. The bridesmaids all had assorted dresses that complimented the florals perfectly. The groomsmen looked great, dressed in Navy Tuxes paired with floral print ties. Maggie wanted to design the wedding to be not only elegant, but also a big party! They hired a wedding band that does a surprise 80’s themed concert. The guests raved about the concert the whole night! A High School Sweetheart Fairytale! When we first met with Kylie and Bryce it was an instant connection. Their sweetness is radiant. 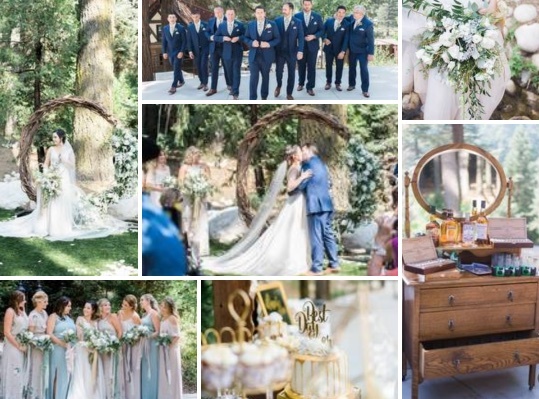 Kylie had a vision of a woodsy fairytale themed wedding. They had a small enough guest count to be located in the SkyPavillion next to our chapel. The Chapel fit perfectly into Kylie’s vision and set a great mood for the evening. The two signed their marriage certificate inside intimately after the ceremony. To top off the evening, there was a gorgeous November sunset that made for gorgeous photo conditions! 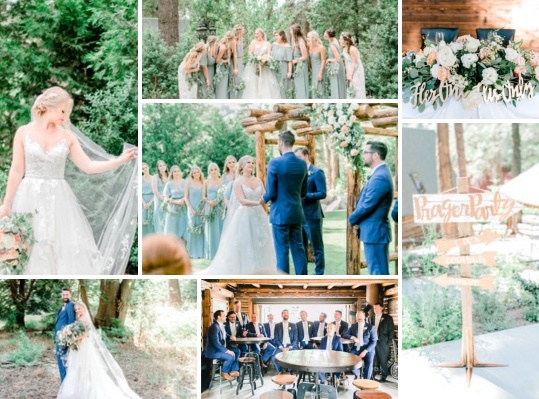 Working with Kylie & Bryce and their families was so enjoyable, we are so lucky to have been able to be a part of their long awaited special day! Taylor is one of our very own! She is our Marketing and Communications manager here at SkyPark Weddings. We wanted to make her wedding everything she dreamed of. Taylor is also a floral designer so it was important to her that flowers were in every aspect of the design. From her wedding dress to the custom photo backdrop, florals were found everywhere! Taylor and her husband, Canyon, have been together since sophomore year of high school. This wedding day was well worth waiting for! 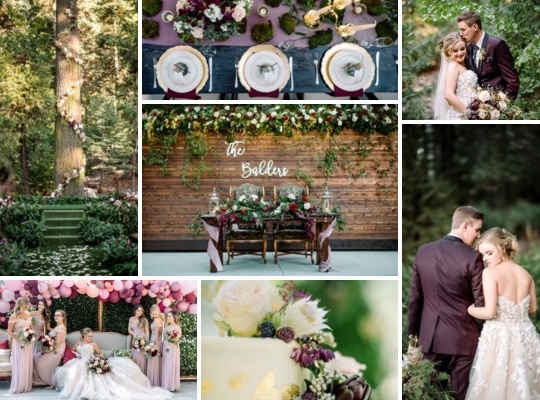 The deep hue of burgundy matched with dusty rose were perfect compliments to each other. The reception was full of dancing and having a great celebration. What a great way to capture their journey together as a couple! Taylor & Gino were so fun to work with! When we met with Taylor, it was shortly after we had done our styled shoot with James Tang. She saw the video that Miguel Garcia shot, and fell in love with the design concepts in the ceremony & reception spaces! We assured her that we were going to make her wedding just as beautiful with the combined effort of all of our talented vendors. She trusted us with her dream wedding vision, and we are so glad she did! The wedding was absolutely gorgeous. The day was perfect, everything went to plan. Taylor and Gino shared the night with 250 of their friends and family! We are so thankful to have been a part of such a special day. 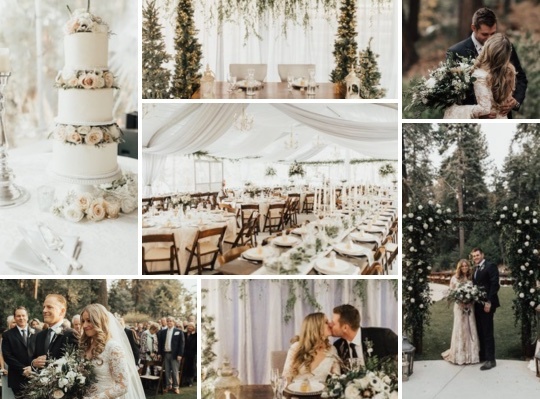 Talk about a gorgeous winter wedding! 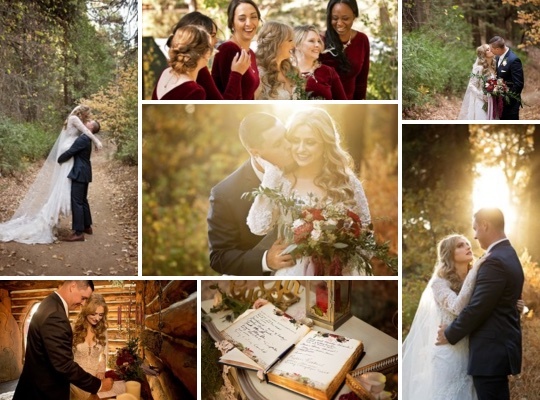 Kami & Trevor were our first couple to have a winter wedding. We tented our reception site with a beautiful white and clear tent that allowed guests to stay warm on this brisk November evening! From the white and silver tent draping to the dark wood farm tables the contrast made for an amazing wedding set-up. They had crystal chandeliers hung above the guest tables that helped set the mood for the beautiful night. When it comes to design concepts for a winter wedding, Kami nailed it. Kami & Trevor were so sweet and gracious throughout our whole planning process. SkyPark Weddings was happy to be able to put together their dream wedding! We loved the venue when we first saw it, even while it was still under construction. Michelle was amazing throughout the entire process, she was always available and answered all of our questions. Michelle and all of the staff were amazing and a joy to work with!